No worry… you can kill young crabgrass that may have germinated in your lawn during the past several weeks with Ortho Weed B Gon MAX plus Crabgrass Killer. And more good news… this spray will kill hundreds of other kinds of weeds, including dandelions, without harming your good grass. You can spray weeds in any kind of lawn except for St. Augustine, Centipede, Bentgrass or Bahia. If you have Bermuda Grass you may get some temporary yellowing after spraying. It is best to spray on a day when temps are between 45 and 90 degrees with no rain or irrigation for at least an hour after spraying. You can plant grass seed 4 weeks after spraying. Now that is good news for Mother’s Day Weekend! I can give you some specific suggestions if you answer a couple of questions for me. Since a wide range of lawn types grow in the Atlanta area (Fescue, Bermuda, Zoysia, Centipede, St. Augustine), it would help for me to know what kind of lawn you have. If you do not know, at least tell me do you have the kind that is brown or green in winter. Also, do you have sun or shade? What did you put on your lawn last and when? I seeded about two weeks ago. I didn’t put down a prevention. I see grass sprouting in some bare spots. But the weeds came back in the other spots. Am I able to still use this? Will I have to reseed? Hi Jermika You could put down the Starter Lawn Food with Weed Preventer without harming your new grass, however not the Turf Builder with Halts Crabgrass Preventer. I don’t think I would put down the Starter with Weed Preventer now since many of the weeds have already germinated. Just mow when your grass is tall enough to cut and deal with the weeds once your new grass has been mowed 4 times. I put down the regular Starter Lawn Food when I seeded. How can I get my grass to grow in the spots versus the crabgrass and other weeds? Hi Jermika Give your new grass time to fill in. Some of the grass varieties in many blends can take a couple of weeks to germinate. Keep your seedlings watered. You should not worry about trying to seed bare areas where the grass did not grow for at least 4 weeks. Have had Scott Lawn Service doing my lawn now for two years and I still have a lot old crab grass (about 25% of the lawn). How can I get rid of this? Do I have the service kill it or take care of it myself? Suggest you contact the service since they are committed to making you happy. They will ID the weed (since there are lots of crabgrass look a likes) and then treat. 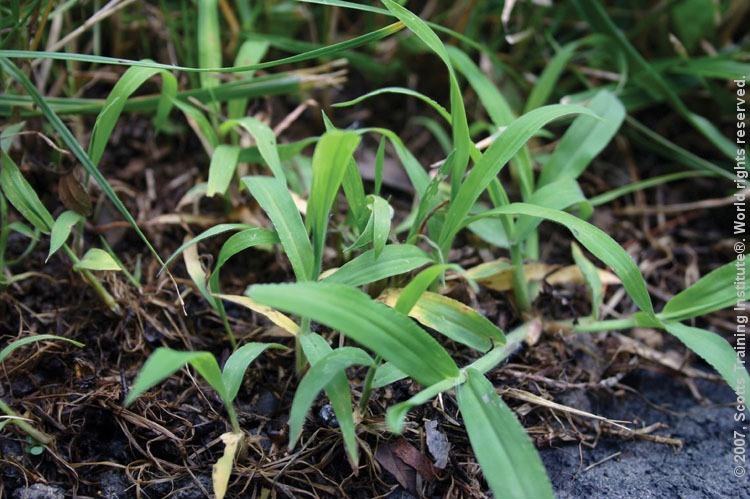 If you live in an area that has had lots of rain this year, there was probably more opportunities for crabgrass to germinate than in a normal year. Good Luck with your lawn.